Life is a series of weird coincidences. 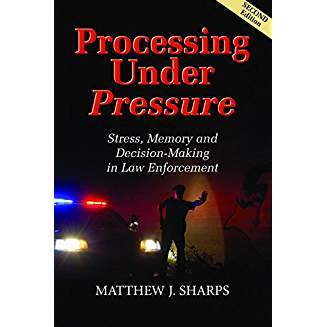 A friend sent me a copy of Processing Under Pressure because the cover used the same stock photo as my book, Force Decisions. It was good for a laugh and it sat on my shelf for months. I finally picked it up for a read and tore through it in two days. This short, readable book covers the effects of short- and long-term stress on the nervous systems; how stress affects perception, decision making, and memory; and gives practical, useful advice on constructing training and formatting information so that it is easier to access under extreme stress. The writing style is comfortable, even conversational. There is a mix of science, statistics, documented laboratory studies and anecdotes the illustrate the main points clearly and effectively. The language was clear— you don’t need a background in neuroscience to follow along. If you are familiar with the world of risk management, you’ll find some interesting cross-overs, e.g. Gordon Graham’s concept of “discretionary time” fits very neatly with Professor Sharps’ Feature Intensive vs Gestalt continuum.